Goldfinch enjoying the cover of the green green leaves on a summer afternoon. 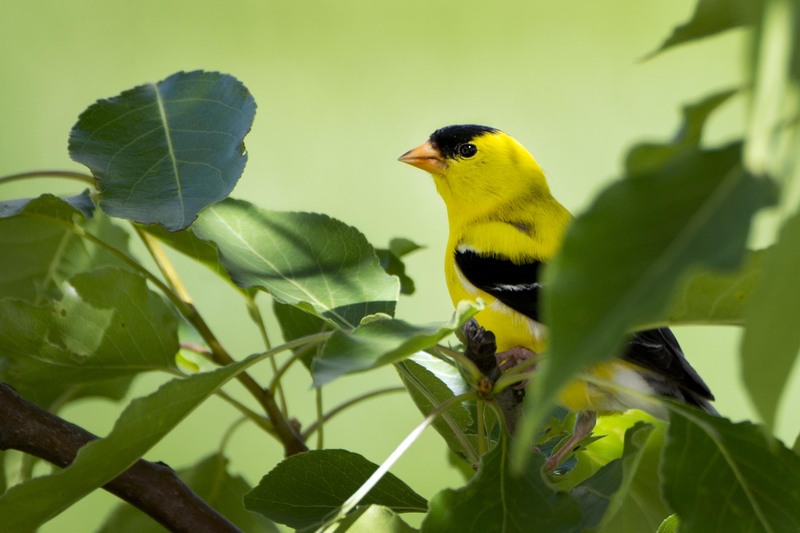 I like the goldfinch, such a beautiful summer bird, great photo! I agree that yellow just says summer. Hope you have a great week. My favorite bird! Every year about now, I start thinking of putting some into my paintings. Lovely photo here. Thanks Anita, I think I have seen a painting of yours with a goldfinch in it on your blog at one time? Hope you have a gret week. Oh, but I love goldfinches. Excellent photo! Thanks, hope your week is off to a great start. Gorgeous! Mother Nature is awesome! Indeed and thanks for the feedback as we really appreciate it. They are late breeders when seeds are in abundant supply. Their diet is only seeds. Only by accident do they swallow an insect. Mike, I noticed something funny. The date stamps on your comments are August 2014. Is this a time warp WordPress theme? HI Jim, well I was out for a week or two and lined up some previously posted photos (reruns) to post on the blog. So no time warp just older photo other had previously commented on. Sounds like my diet with respect to the insects. Nice one Mike! Love the colours and lighting. Thanks LB and your smiling makes me smile. Hope your week is going well.